Halloween season is in full gear in our home. We are decorated with pumpkins, cute ghosts and ghouls, and may be loaded up with candy (not sure how long that will last?). 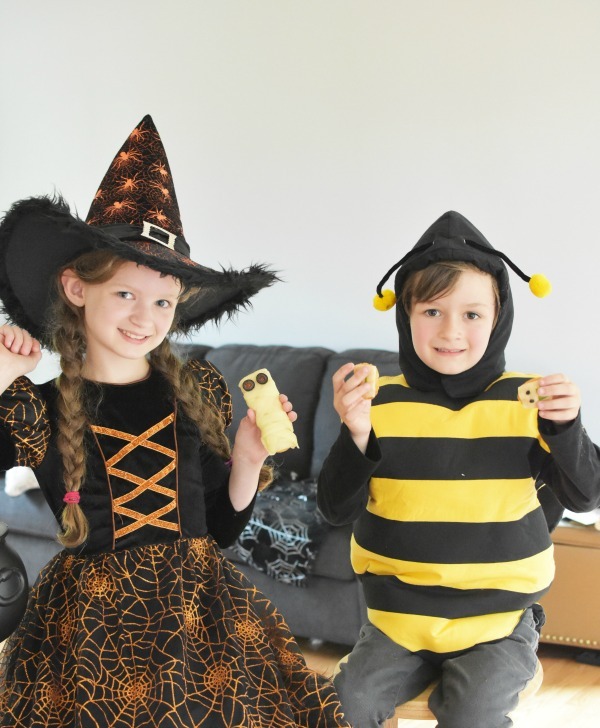 To enjoy the month of tricks and treats, I have been making cute little spooky treats for my kids. My son has THREE Halloween costumes. This Bee one was Jared’s when he was 5 so I needed to get a shot of Blake in it! 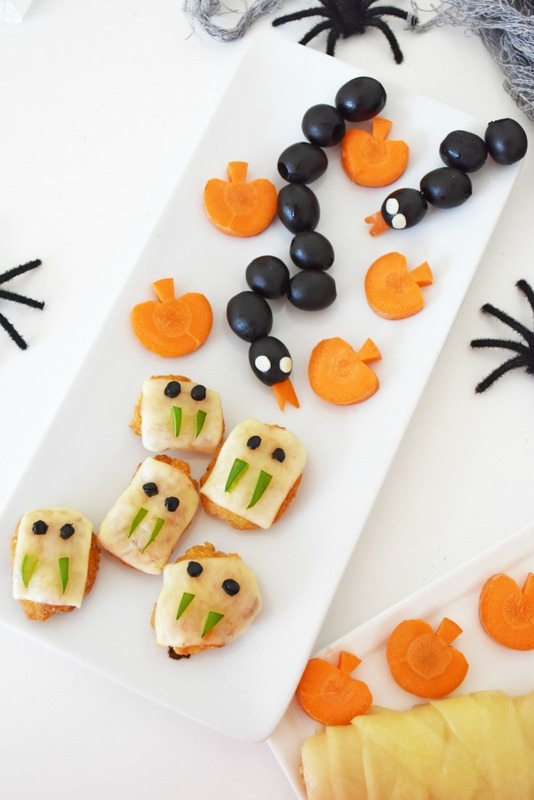 Creepy pancakes, Halloween snack mix, and these Fish Mummies & Silly Monster Shrimp are all foods my kids have been enjoying. I love being super creative and silly when it comes to foods and my 3 kids really appreciate that. I figure they are only young for so long so why not have fun with each season? This week Fish Mummies & Silly Monster Shrimp were on the menu. 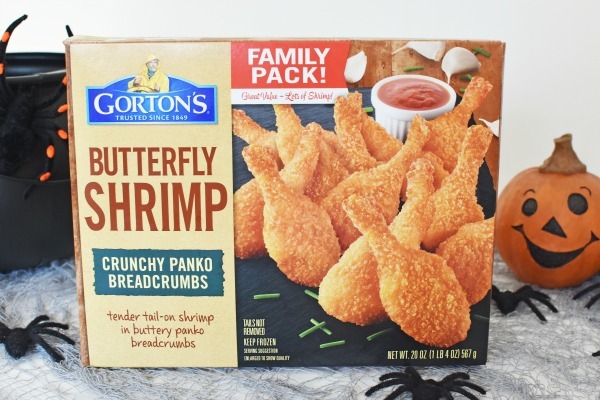 I used Gorton’s Crispy Battered Fish Fillets, and Crunchy Butterfly Shrimp. These quality seafood products can be purchased in the frozen aisle at your local markets. They are a New England based company (YAY) out of Gloucester MA and only the BEST frozen seafood. View their extensive line of seafood products on their official site. For these Halloween fish creations, I definitely winged it!! 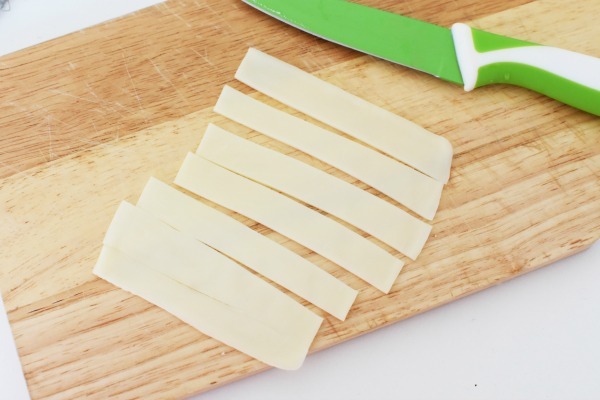 I wanted to initially make little ghost fish but once I started slicing the mozzarella cheese, I thought of fish mummies. I already had the olives on hand so I knew it would not be too difficult! The Shrimp Monsters were a 100% cute creation that I made on a whim. I knew I wanted to do something fun with the Crunchy Butterfly Shrimp so I covered them with some mozzarella cheese (a match made in foodie heaven) added some little tiny olive eyes (thanks flexible straw) and made some green pepper teeth. By cutting off the tails, I had the perfect shrimp “nugget” to work with. For the Fish Mummies, I used Gorton’s Crispy Battered Fish Fillets, olives, ketchup and Mozzarella. I cooked the fish according to the package and did the mummy cheese lacing at the very end. The olives and ketchup, were last followed by a quick oven melting session using the oven’s residual heat. You do not want to over cook these or they will turn into ghosts…haha. 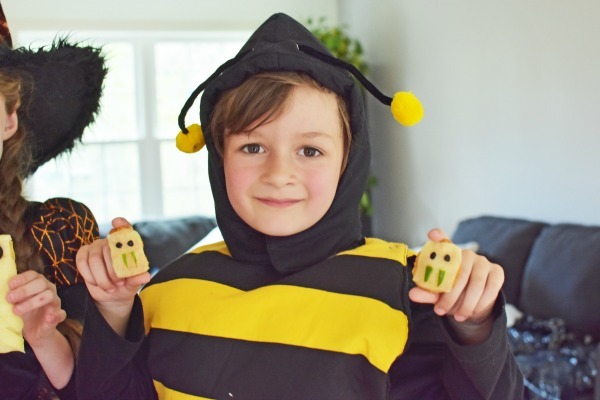 The end results were the cutest Halloween Fish creation ever…not to mention the tastiest! My three kids loved them with some tartar sauce and gobbled them all up. 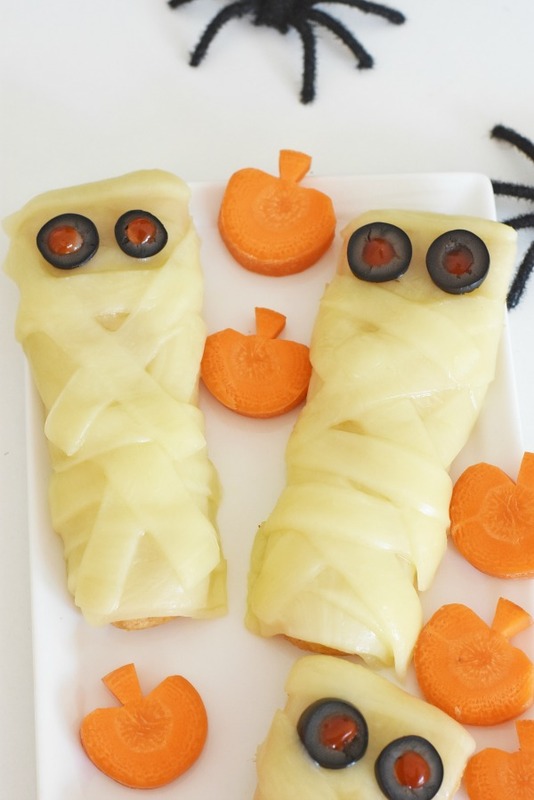 These would make perfect Halloween dinner meals. 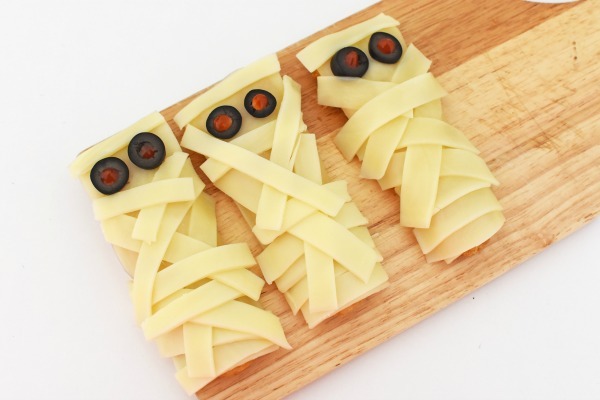 They are actually pretty quick to make and you could slice the olives/peppers/and cut the cheese “mummy strips” ahead of time to expedite things. 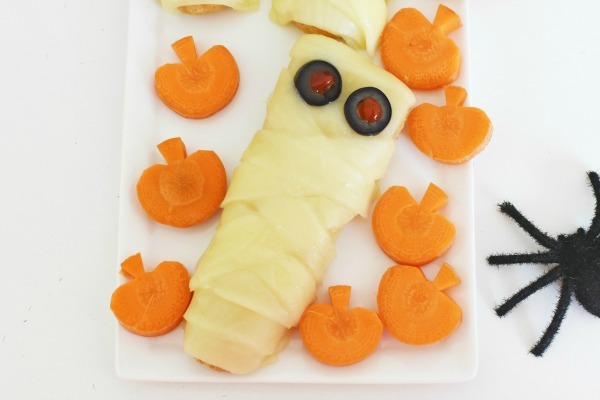 Want the full HOW to make Fish Mummies & Silly Monster Shrimp Tutorials? Get them below! Cook fish according to package instructions. Once stil warm, wrap fish with 1/2 inch thick slices of mozzarella cheese. Adhere olive eyes, and fill in the middle with ketchup. Toast in the oven for 3-5 mins using residual heat or a 1 minute broil. Cook Shrimp according to the package instructions. Once done, carefully slice off each tail. 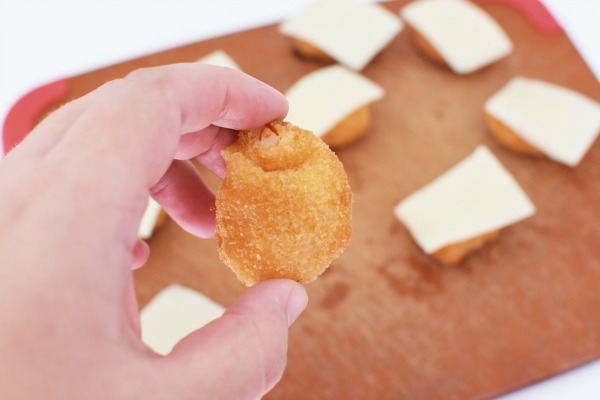 Cut Mozzarella cheese into small squares to cover the shrimp. Using a flexible straw (so they can pop out) press straw into olives to get little black “eyes”. Using a sharp knife, carefully cut a green pepper into tiny fangs. Adhere cheese, eyes, and green pepper fangs. Toast in the oven for 3-5 mins using residual heat or a 1 minute broil. You will also notice cute pumpkin carrots. I was inspired to make these from Little Dairy on the Prairie. The olive snakes were easy and used whole black olives, the flexible straw to make mozzarella cheese eyes, and carrot tongues. 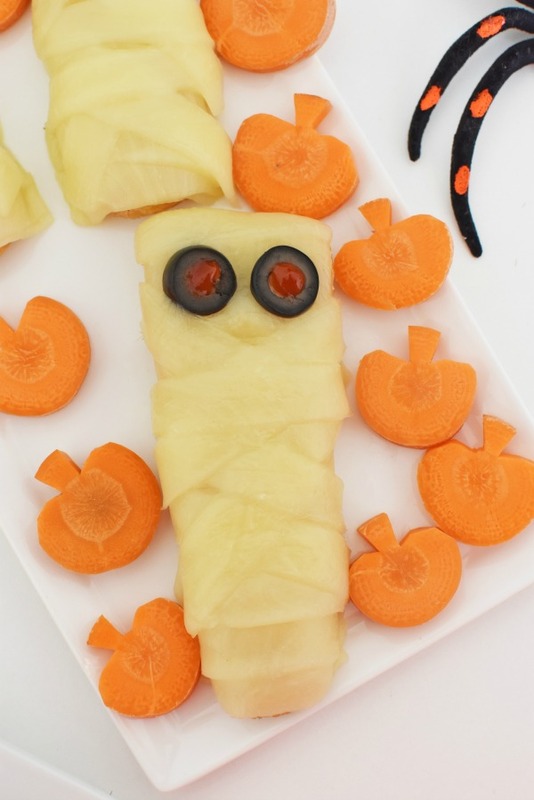 Overall, these Fish Mummies & Silly Monster Shrimp make the perfect Halloween meals for your kids! 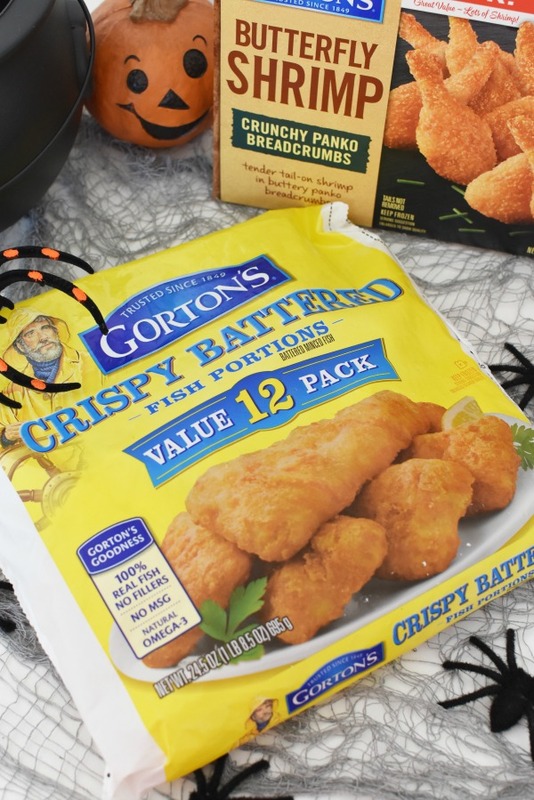 Will you be purchasing some Gorton’s Seafood products to make these spooky meals? These are absolutely adorable! I bet kids that don’t like fish products would gobble these up! Love the tutorial, too – you made it look really easy! This is so cute! 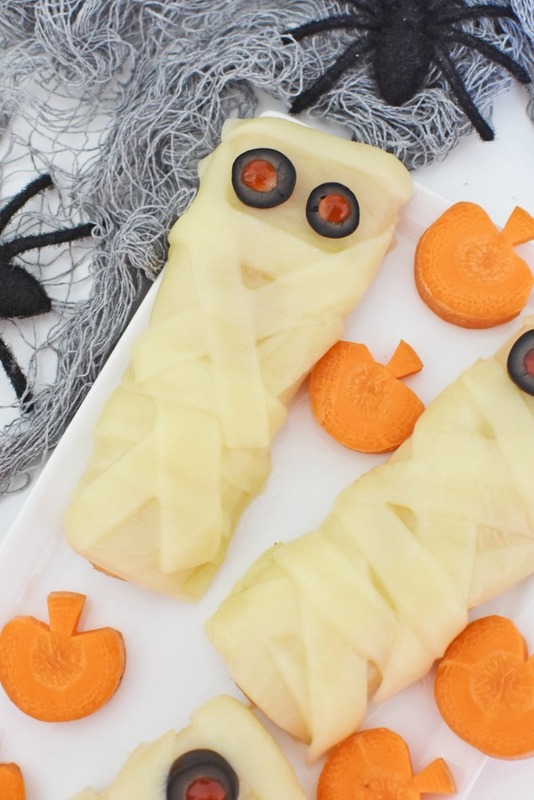 It’s seriously fun to read post like this that are so creative with Halloween and food. I enjoy it because it gives me great ideas. My kids eat this as quickly as they put it on their plate. Those are super cute! I love that you also cut carrots into pumpkins to get some veggies in the kiddos, too! 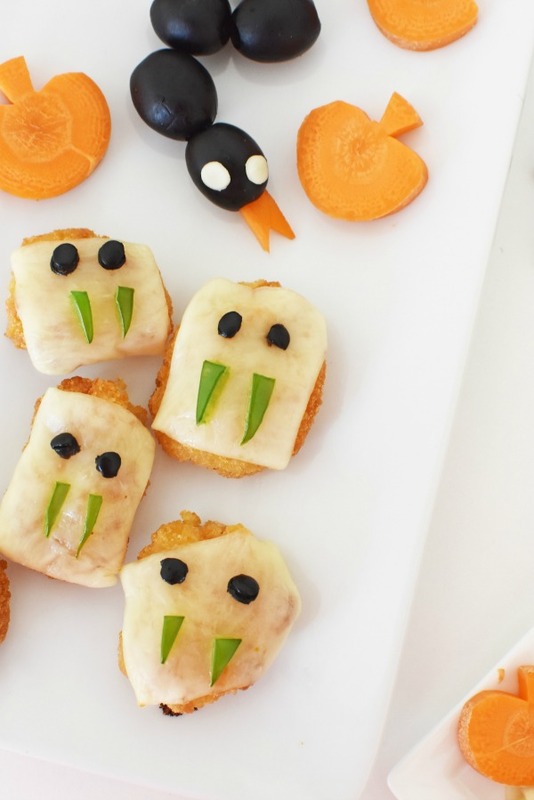 These are really cute food treats for Halloween! I think any kid would be thrilled to see one of these on their plate instead of the usual plain fish fillet. I love your little carrot pumpkins too! You made everything look perfect for a spooky fun dinner. This is a most creative way to dress up fish and shrimp. I wish I had thought about this one because fish is such a healthy protein for growing children and you have made it so much fun. This is such a fun idea. I love Halloween! Being able to create a lot of recipes for Halloween is always so much fun. That looks so good!! 🙂 and so fun. I need to make this with my cousins. Such a cute idea! The mummies are adorable but I’m loving the shrimp too! I have to do this for my kiddos on Halloween! Those fish mummies are just too cute. I bet all that cheese tastes amazing with it. He has three costumes??? That’s crazy! I bet he loves all of them. 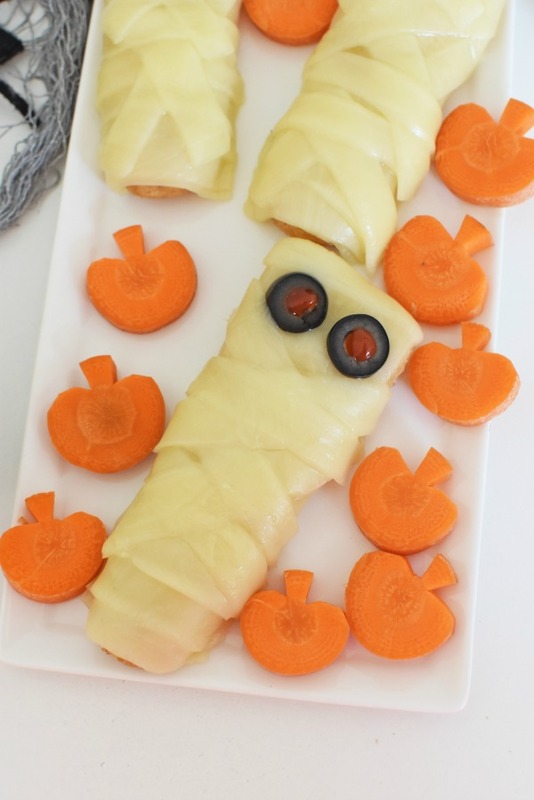 What a fun Halloween night dinner idea! My kids love festive foods! These costumes are adorable. These are great snack ideas. I will have to make some for the kids Halloween party. Oh how fun! This is the perfect after school snack for my grandkids. I’ll be the best grandma ever. Happy Halloween! 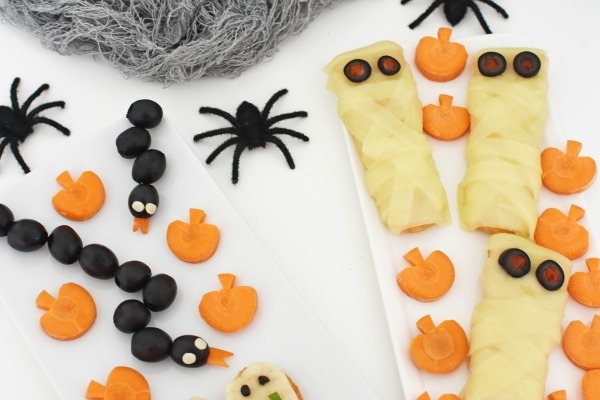 This is such a fun Halloween treat! 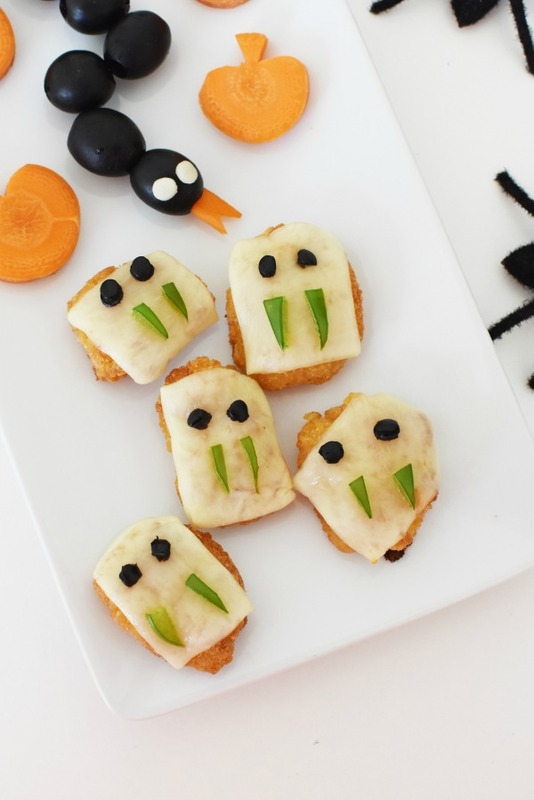 Our family loves fish sticks and this is a great way to dress them up (literally) for Halloween! I love the Fish Mummies. This is gonna be the kids Halloween favorite treat! I love all of these ideas! They are just so cute and the kids would have a blast eating them all up.